Homeowner Christopher Solar is a very talented furniture designer and builder. 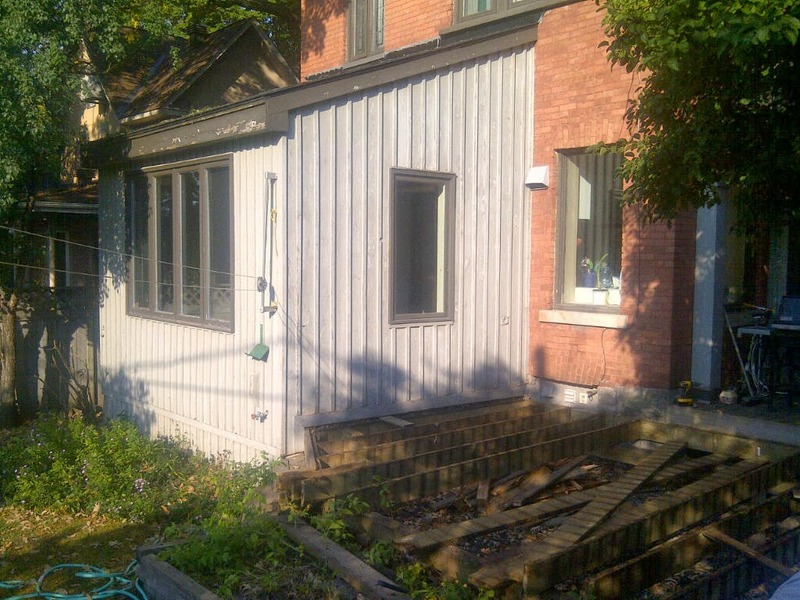 His old home in Ottawa South has seen renovations before. 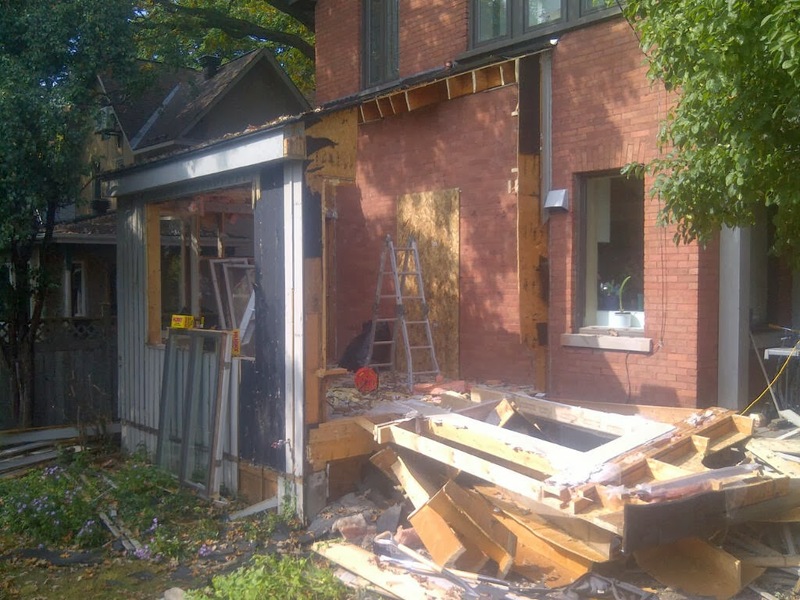 This time, a deck-come-3-season-room is being demolished and properly re-built to be part of the living space year round. The new space was designed by Renzo Cecchetto, principal designer at funktional design. Renzo is certified with the Ministry of Housing and Municipal Affairs to submit code-compliant permit and construction-ready plans to City planning departments. The project is expected to take five weeks. “Before”. 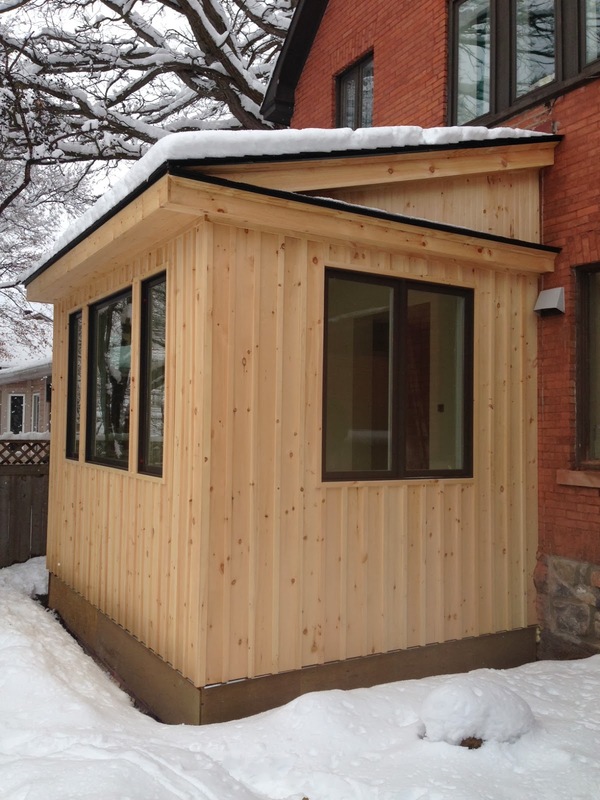 The base of this “extension” was basically a deck with a room built overtop. It was freezing in the winter, not matter how much heat they pumped in or insulation they put underneath (and there was A LOT of insulation). 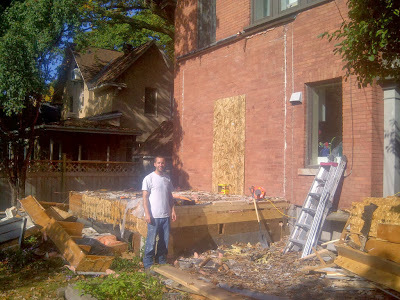 Day 2: Demolition continues. The roof and one wall are gone. Day 3: It’s mid morning and the structure is down. Now for the base. Day 4: The old structure is gone. 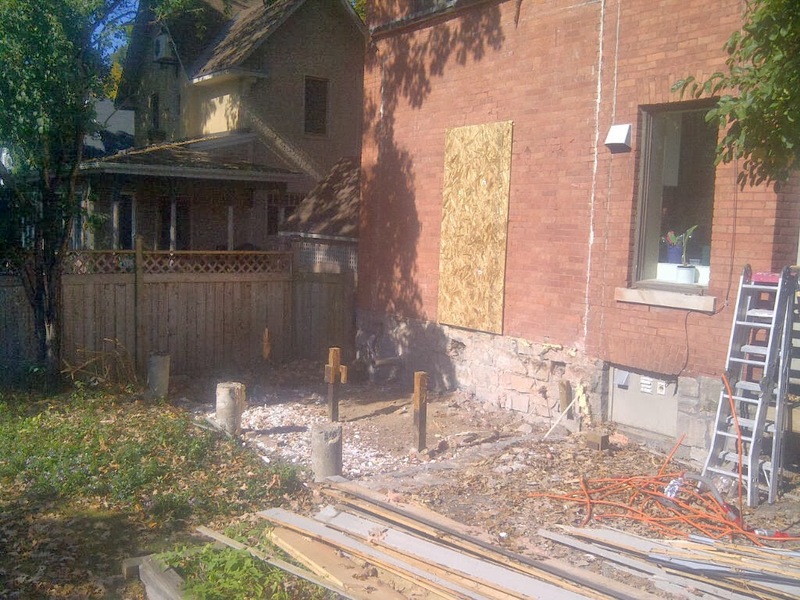 You can see the footings underneath were basically for a deck. This was not a proper extension. 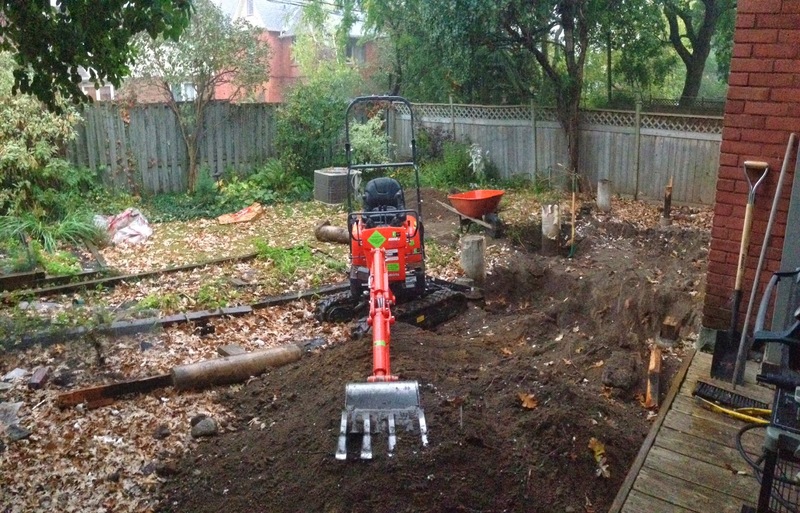 Now just the old deck footings to remove before we dig for a proper foundation. Day 6: Foundation digging underway for a “frost protected shallow foundation”. 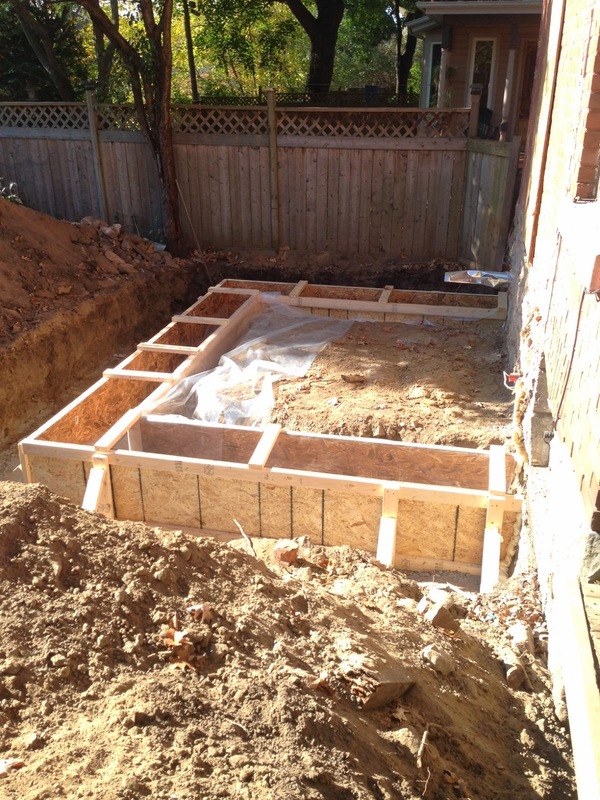 The footings will be only 2-feet below grade and the hole will be 30″ deep and 4′ wide. 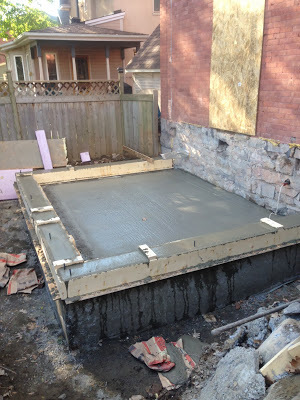 Day 10: Forms for the footings are done and ready for a concrete pour. 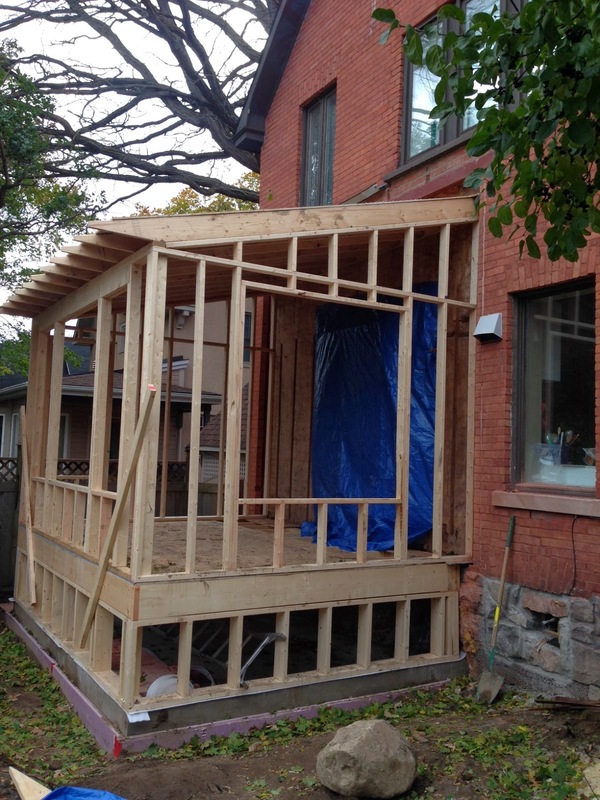 The first City of Ottawa inspection was yesterday and the build passed with flying colours. Day 11: 60 wheelbarrows each with 100 kg of cement. 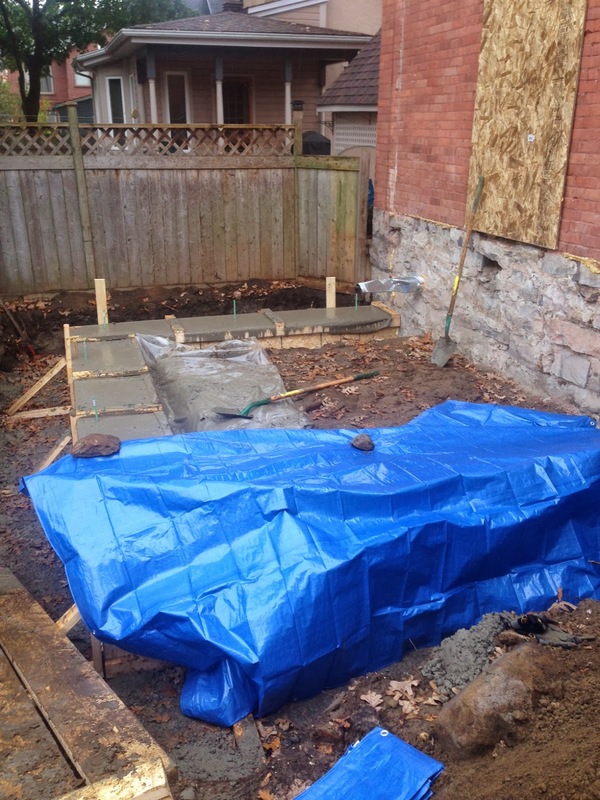 The footings are done and tarped for drying. Who needs the gym? another 1,000 kg carried in (30 kg bags) and mixed in our mixer. Day 19: Wall and roof framing are done. Aced the second City inspection. 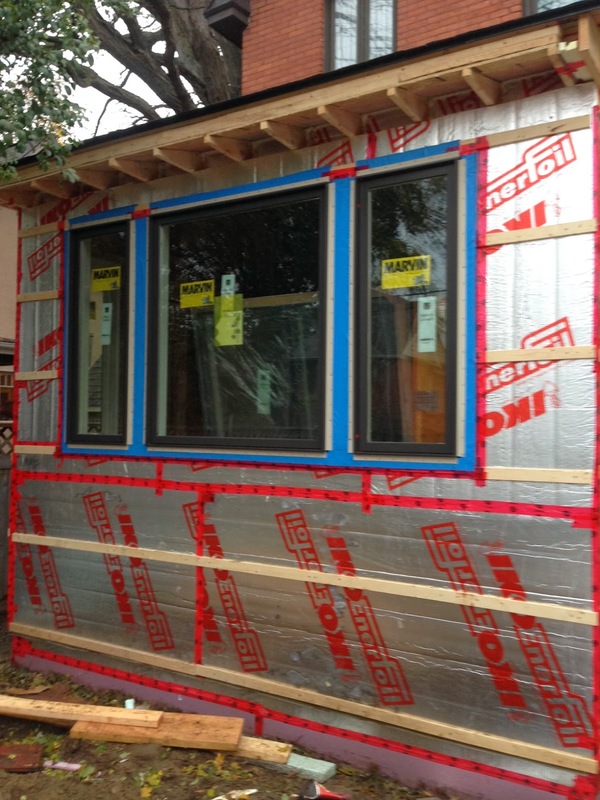 Day 23: 3″ of polyiso insulation on the walls and 4.5″ inches on the roof. The roof is shingled and exterior strapping is done. We’re ready for windows. Day 24: The windows arrived this afternoon and all but one are in. 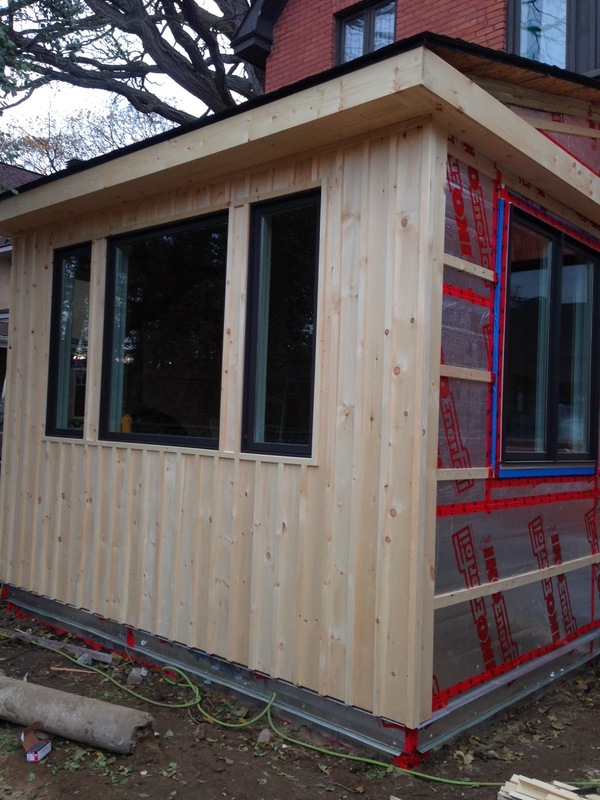 Day 27: The board and batten siding is complete on the front and the windows are trimmed too. Day 29: Roxul insulation added in one layer to the walls and two layers in the ceiling. 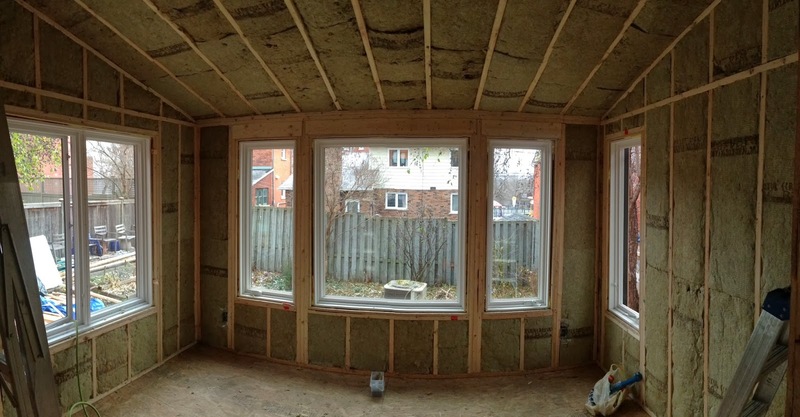 Vapour membrane to be added before our next inspection and then we’ll drywall the room. Painted “Cotton” on the walls and installed plywood subfloor. 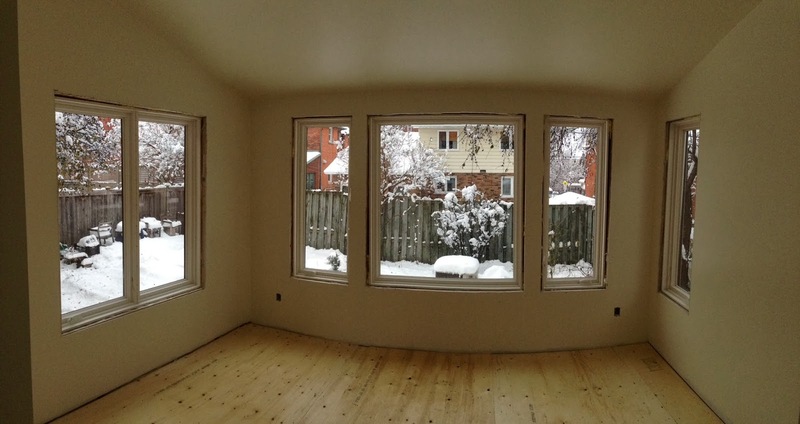 Homeowner (and skilled carpenter) Chris will take care of the window trim and a flooring company will finish up… well the flooring. 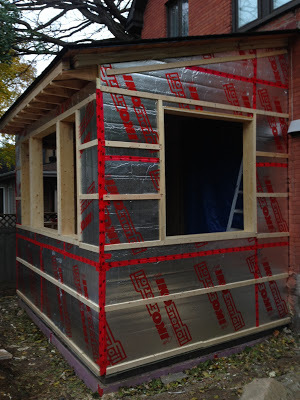 Day 33: Exterior done… until spring when we’re back to paint the wood.